"Took a little bit to get going... Struggled to find the right settings to enter into the router software to match my Orcon NZ, but eventually got it working. 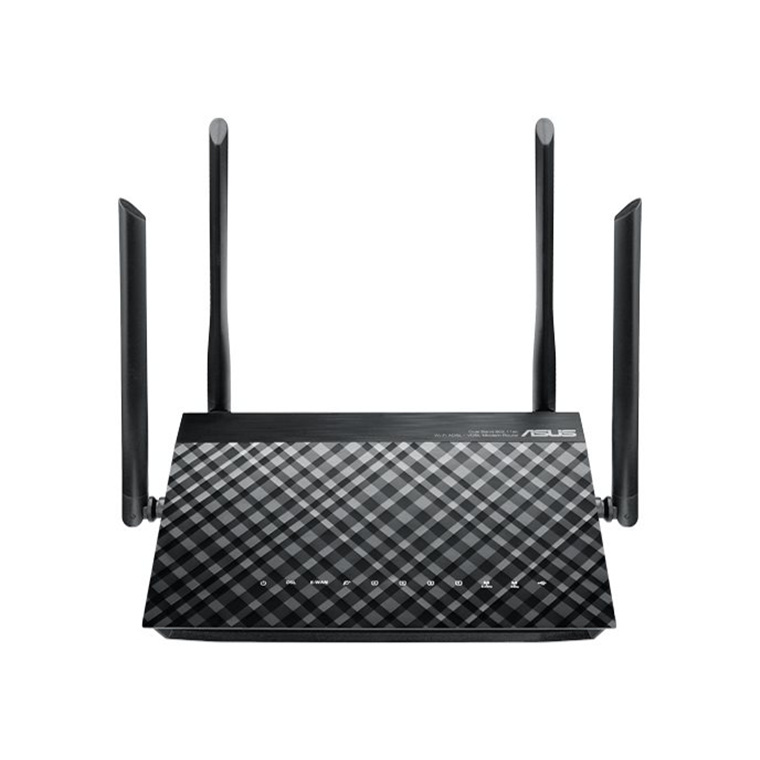 Nice and fast, good signal and no drop ..."
"This was a great upgrade from the standard router that shipped from my ISP and with the dual band I noticed a massive increase in WIFI speed. I am an advanced user and I appreciated all the advanced..."
"Really good modem fast and no faults"
The ASUS DSL-AC55U is a ADSL/VDSL 802.11ac Wi-Fi modem router, with combined dual-band data rates of up to 1167Mbps. 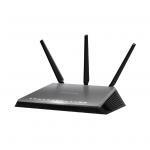 On the 5GHz band, 802.11ac gives 867Mbps wireless data rates, while 2.4 GHz 802.11n performance supports 300Mbps. Compatible with ADSL2/2+, ADSL, VDSL2, fiber and cable services, the top specification completes future-proofing. 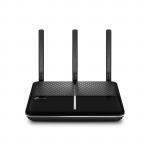 ASUS AiRadar enhances the Wi-Fi stability and improves coverage up to 150%*. Most importantly, the universal beamforming not only works on 802.11ac clients, but also 802.11a/b/g/n clients. Equipped with powerful hardware NAT acceleration and built-in Gigabit Ethernet, the DSL-AC55U gives you full Gigabit internet performance, with a WAN-to-LAN throughput performance of over 900 Mbps. USB 2.0 port allows the DSL-AC55U to share printer and scanner over a network, and it can also operate as high-speed NAS (Network Attached Storage) device when external storage is connected. The easy-to-use ASUSWRT graphical user interface unlocks the power of DSL-AC55U giving robust control to optimize your network for you. 30-second setup and easy traffic management means even network newbies can enjoy its sophisticated features, while power users will love its IPv6 support, multiple wireless SSIDs and encrypted VPN access. ASUS AiRadar intelligently improves wireless connections by using exclusive ASUS RF fine-tuning. This ensures extended coverage, increases dynamic data speed, and enhances stability. Equipped with a powerful hardware NAT acceleration engine and built-in Gigabit Ethernet, the DSL-AC55U gives you full Gigabit performance. Its WAN-to-LAN throughput performance is over 900 Mbps, which is more than 4.5 times that of traditional software-based NAT Gigabit routers. This reduces the possibility of bottlenecks on fast internet connections. 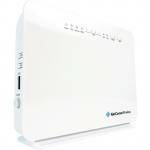 Make DSL-AC55U your media and device center. 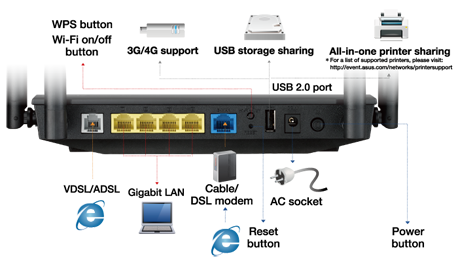 With built-in two USB ports, connect external storage drives, printers, scanners and many other USB-enabled devices to share with your networked PCs. Having your devices networked, lets you access them easier than ever before. 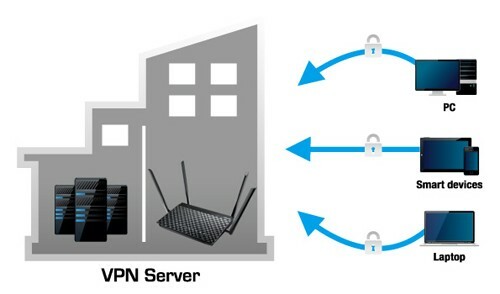 With the virtual private network (VPN) server and VPN client, you can access your home network remotely or surf the internet with encryption, no need for paid VPN services or a dedicated VPN server. Power Consumption : 18 W Max. Is it suitable for Orcon Gigantic fibre? Faulty Modem Router but looks great. Thanks PB tech...…….for giving me a refundFaulty Modem Router but looks great. Took a little bit to get going... Struggled to find the right settings to enter into the router software to match my Orcon NZ, but eventually got it working. Nice and fast, good signal and no drop outs. :)Took a little bit to get going... Struggled to find the right settings to enter into the router software to match my Orcon NZ, but eventually got it working. Undecided... works sometimes, keeps dropping. A product with full functionality. I'd say it was more oriented to a enthusiast user who wants to do more with the router than just the usual stuff.A product with full functionality. I'd say it was more oriented to a enthusiast user who wants to do more with the router than just the usual stuff. 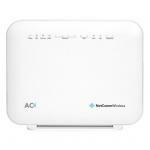 Works well on Spark VDSL and the speed is very good on ethernet and wireless. The range is very good and can still be connected to from the street outside about 15m and 4 walls apart. It also doesn't get very hot like many other modems which usually causes problems. The speed remains around 4 MB/s even with 2 simultaneous HD video streams and 1 large download. The modem does have occasional disconnections, but reports that the "phone line seems unstable" . This problem only occurs at my house, so it seems my phone line is not very stable. Probably not the fault of the modem.Works well on Spark VDSL and the speed is very good on ethernet and wireless. The range is very good and can still be connected to from the street outside about 15m and 4 walls apart. It also doesn't get very hot like many other modems which usually causes problems. The speed remains around 4 MB/s even with 2 simultaneous HD video streams and 1 large download. The modem does have occasional disconnections, but reports that the "phone line seems unstable" . This problem only occurs at my house, so it seems my phone line is not very stable. Probably not the fault of the modem. As a non tech person, ease of setting up the modem router was important. The unit took more than the 10 minutes stated, but was straight forward. We have a 2 storey house, with very limited previous wifi upstairs. 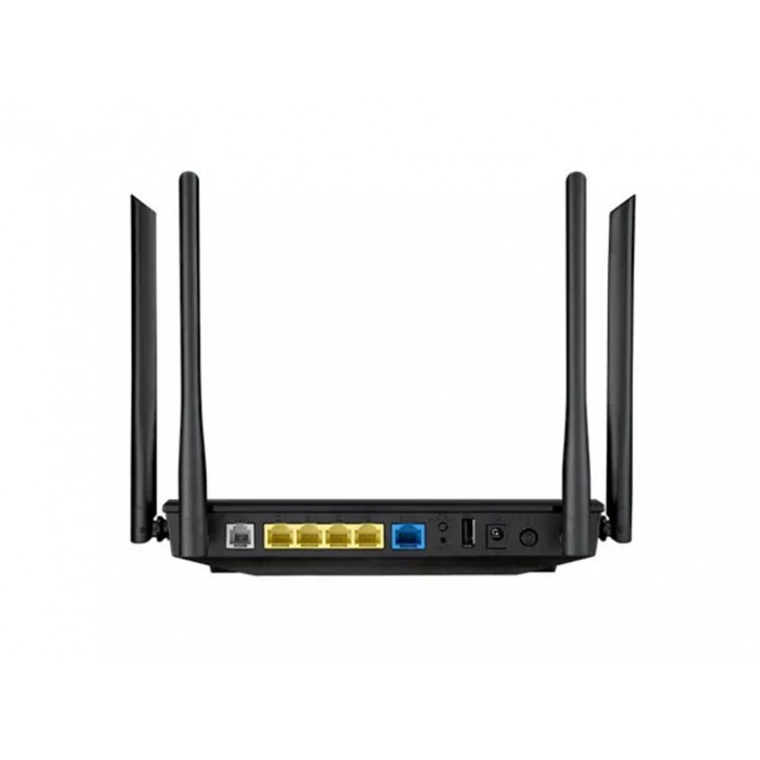 The new router now provides much wider access as well as being available in many outside areas and easily handles 3 devices we often have connected. After 2 weeks operation there have been no resets or signal degradation, so I'm very happy with the product so far.As a non tech person, ease of setting up the modem router was important. The unit took more than the 10 minutes stated, but was straight forward. We have a 2 storey house, with very limited previous wifi upstairs. The new router now provides much wider access as well as being available in many outside areas and easily handles 3 devices we often have connected. After 2 weeks operation there have been no resets or signal degradation, so I'm very happy with the product so far. Purchased this modem for a new fibre connection. Configuration was easy enough, even having set up quite a few modems before, first timers shouldn't have too much trouble with this (can find help online / on PBTechs website as another reviewer has advised). Has been in use for 3 weeks so far and no issues to speak of.Purchased this modem for a new fibre connection. Configuration was easy enough, even having set up quite a few modems before, first timers shouldn't have too much trouble with this (can find help online / on PBTechs website as another reviewer has advised). Has been in use for 3 weeks so far and no issues to speak of. Easy to setup.Easy to setup. PB Tech price: PB Tech price: $199.13 ex. $229.00 inc.